When disaster strikes the Mobile Pantry is ready to help. Ann resides in a low-income senior living facility since 1989 due to a mental disability. Although she is 82 years of age, she keeps up with the best of them. She loves to spend time creating stenciled art and stitching brightly-colored cell phone pouches and decorative pillows. Ann takes great pleasure sharing her hand-made crafts with guests and fellow residents. 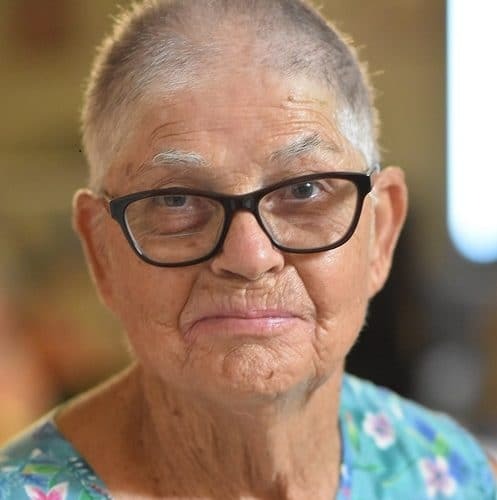 For Ann and the other residents, life at the housing facility was peaceful and good until an enormous monsoon struck and knocked out the electricity. The power was off for several days spoiling everyone’s refrigerated food. St. Mary’s was alerted to the situation and answered the call. A ‘pop-up’ mobile pantry was quickly dispatched and residents lined up to receive eggs, milk, cheese, potatoes, fruits and vegetables like cantaloupes, grapes, tomatoes, salad and a box of canned goods. Ann is used to eating TV dinners most days with the exception of Sundays, when she goes out to eat with her friend after church. So receiving the fresh produce and a food box from St. Mary’s was a real treat. It’s important at any age to have healthy, balanced meals so when the call came, we were happy to lend a helping hand. Thanks to your support, this crisis Ann and her friends at the senior center experienced had a happy ending. Because of you and your generosity, St. Mary’s Food Bank is always ready to answer the call.